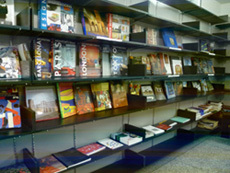 Dhaka Art Center’s very own library and resource center provides the general public with a growing archive of texts and other media on art related subjects. The library offers a collection of essential books on topics ranging from architecture to theatre. The library space also stores a selection of films by important filmmakers and an archive of newspapers, magazines, periodicals and other necessary art publications. Since 2010, the time we have started our activity, we are trying to develop a rich Resource Center at our premise. Dhaka Art Center’s Resource Center provides the general public with a growing archive of texts and other media on art related subjects. The center offers a collection of essential books on topics ranging from art, architecture to theatre. The Resource Center also stores a selection of films by important filmmakers and an archive of newspapers, magazines, periodicals and other necessary art publications. From the very beginning Resource Center has been trying to provide hundreds of art lovers, art related researchers, art students in our country with free access to library and photocopy as well as internet services. These accesses are made possible through the generous donations of our trustee members. Last year, generous donation of HSBC Bank helped purchase new books for our growing Resource Center. Without such generosity and support, none of this would have been possible. This year, our goal is to enrich our Resource Center with new books, magazines, periodicals, DVDs and all other necessary art publications. We hope to give our readers-viewers this advantage in life. We hope you will join us in reaching our goal by donating books, magazines, periodicals, DVDs and all other necessary art publications. For more information, please contact us directly at dhaka.art.center@gmail.com or 01191776511. To download list, just click the link.